It’s a situation familiar to many women: You’re in a contentious meeting with male colleagues. Your turn to talk comes around, and just as you get going, someone else begins talking loudly. Then another person. Within seconds, your colleagues are talking among themselves, and you’re trying to find a place to jump back into the conversation you were leading just moments before. It happened Tuesday in front of national media at the White House, during a heated exchange over funding for the border wall and a looming government shutdown. This particular conversation included President Donald Trump and the Democratic congressional leaders Chuck Schumer and Nancy Pelosi, the latter of whom Trump interrupted 15 times in a short discussion. These might be extraordinary circumstances, but the interaction itself isn’t for many women across the political spectrum and at varying levels of professional power: When someone in America gets interrupted or talked over, it’s probably a woman, and there’s no level of success that appears able to subvert that reality. 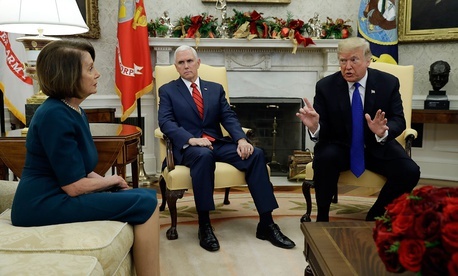 At one point, Trump said, “Nancy’s in a situation where it’s not easy for her to talk right now.” He may have been referring to Pelosi’s precarious position atop the House Democratic Caucus, but it’s just as accurate a characterization of her literal ability to participate in the conversation. Not even the most powerful women in America get to finish their thoughts. Researchers have been investigating who interrupts and who gets interrupted since at least 1975, when a landmark study at Stanford University found that, out of 31 conversations examined between partners of various gender pairings, men were responsible for all but one interruption. American notions of gender roles and interactions have changed a lot in the intervening 40 years, and a 2014 study from George Washington University suggests that’s brought a certain amount of parity to the act of interruption: Men and women in that study interrupted others at similar rates. Where gender differences remained pronounced in the 2014 study was in who got interrupted: Speakers of all genders were far more likely to interrupt a female conversation partner. This dynamic is perhaps most visibly borne out at the highest levels of government. In 2017, Senator Kamala Harris was cut offduring her questioning of then-Attorney General Jeff Sessions by two male colleagues. During the 2016 presidential campaign, Trump interrupted Hillary Clinton 51 times during one debate; she interrupted him 17 times. Tuesday’s White House meeting was not the first situation in which Pelosi, a very powerful woman by all measures, has had to fight to get a word in edgewise with her colleagues. Indeed, research has demonstrated that professional power alone isn’t enough to mitigate the disadvantage of being a woman in a conversation. According to a 2017 Northwestern University study, female Supreme Court Justices were more likely to be interrupted than their male colleagues, and it was usually their male colleagues doing the interrupting. The researchers found that in order to avoid being talked over, female justices usually adopted more aggressive questioning styles that mirrored their male counterparts over time. The data suggests that even though mirroring male conversational styles did help them, it wasn’t enough to pull female judges even with their male colleagues. In the context of #MeToo-era tension over gendered power disparities in the workplace, women’s irritation with these discursive roadblocks is starting to seep into public view. Democrats seized on Republicans’ public interruption of Kamala Harris as a fundraising opportunity. In an attempt to shut down Senator Elizabeth Warren on the Senate floor, Majority Leader Mitch McConnell inadvertently created a meme in “Nevertheless, she persisted.” There’s considerable interest in reclaiming these interactions as a point of empowerment or advantage, even if it’s not entirely clear how that might be done. Still, there’s an imbalance in whose persistence becomes a cultural touchstone and whose is criminalized, met with violence, or simply ignored. After Trump interrupted to mention her caucus troubles, Pelosi countered firmly: “Please don’t characterize the strength that I bring to this meeting.” That people notice Pelosi being interrupted and take exception is an indication she doesn’t need help standing up for herself in the first place. But there might be a young woman in your office who does.